The 2nd Annual Library Day in the Life started today. Same rules apply – “whether you are a librarian or library worker of any kind, help us share and learn about the joys and challenges of working in a library.” So after a full day of work, walking of the dogs, mowing part of our 2 acres, fixing dinner and cleaning up I finally sat down to watch “The Hunting Party” episode of season two of Lost while I put my notes into a blog post. Got to work just before 7:30 am to find that I wasn’t the only early bird this morning. Julian Clark (who is also participating in this via Twitter – @julian2) was in before me and already hard at work. Swapped out the backup tapes and exchanged last week’s set for the new set for both the Horizon and the Authority Works servers. Email to head of collection services about removing titles from catalog that aren’t part of Overdrive anymore. Answered IM question from librarian about OpenOffice and adding page numbers. Found answer by Googling – gee, why didn’t the librarian do that? Investigated how we managed to have Maryland spelled incorrectly on one of our PAC screensavers for the last couple of yrs. After 3:30 pm so it’s time to go home. WHEW, what a day. Day 5 of week of keeping track of what librarians or library workers do so we can see the diversity of the jobs we do. 10:10 – discussed with Sys Admin about some errors and concerns over day end process a couple of days ago. Sadly neither of us is 100% sure who messed up what or did the system fail to finish a process. Day 3 of week of keeping track of what librarians or library workers do so we can see the diversity of the jobs we do. 11:15 – arrived at work (late opening because of ice conditions) after attempting 3 times (4th was the charm) to get up the hill on my road so I could get to work. Main roads fine but side and back roads are still a mess. 11:20 – took call from staff member about computers not recognizing IP address. Network Admin made a change and the Linux computers stole the Windows IP’s – poor Windows didn’t know what to do. 11:40 – perform morning task such as checking our catalog (login, searching and requesting working), making sure Day End process finished correctly as well as several other processes, checking several server logs, making sure Zserver connects to Marina (our ILL for the state), verify that telephony system is working, etc. 1:45 – wrote announcement to remind staff of URL change on Marina (statewide ILL system) and notified Sailor so they can change it on their site. 3:02 – created sign to welcome our new staff member Julian Clark to IT dept. 3:43 – home to get ready for Lost and hope I don’t fall asleep before 9 pm! Day 1 of week of keeping track of what librarians or library workers do so we can see the diversity of the jobs we do. 7:15 – arrive at work – disarm alarm, unlock elevator and open office. Remove tapes, clean tape drives (on both Horizon server and AuthorityWorks server) insert new tapes. 8:15 – check email, Facebook, Friendfeed, Twitter and RSS feeds. 8:30 – discuss current LOST theories with 2 of my co-workers. 9:30 – investigated extra white spacing in our Highly Recommend blog. Part of the problem is code we had added that previously had to be there to keep 2 images from bleeding over into next post. But still the problem exists so something in the WordPress code will have to be looked at. 10:37 – started one of my Grooveshark playlists and went through bounced back emails (from our pre-overdue, overdue and hold notices), removed emails from Horizon database and made note on customer’s accounts. 11:15 – planned Picasa training for Library Associate Training Institute students since we aren’t a Microsoft shop and we can’t use Photostory3. 1:18 – struggling to find CC images on Flickr that I can use for my CIL09 presentation. Even contacted CC Guru, Michael Sauers, to verify which photos I could and couldn’t use. Frustrated because I find a perfect image – only hope is contacting the owner and seeing if they’ll grant me permission to use it in my presentation. *Contacted owner and they agreed to let me use it in the presentation – WHOO HOO! Get cuil, boy! Real cuil! Former Google staff members create new search engine. Hmm, decided to give it a try by doing a search for Lost. Prettier display but not sure of the layout of search results. Will be interesting to compare results to see which one gives me what I want. Just not sure it will become part of the vocabulary like Google did. 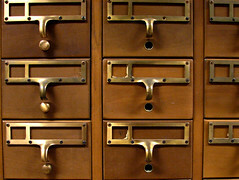 Is there room for yet another search engine? Will Google pull a Microsoft and try to squeeze Cuil out of the arena? Only time will tell. Most people have a list, or in some cases an actual tape/cd, of their favorite songs they couldn’t do without if they were stranded on a deserted island. ABC.com and Lost have done it one better – Lost Book Club. 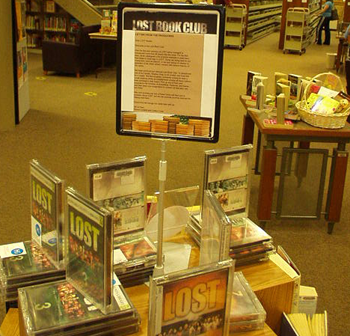 Inspired by my addiction to Lost, I created a display at the Central library. Using the letter from Damon Lindelof and Carlton Cuse (posted on the ABC.com web site) as the basis for my sign, I then divided the cube into 3 seasons. Using the top layer for the DVDs of Lost, I then arranged the books below them that corresponded with the appropriate season. I’m honored that they allowed me to set this up directly in front of our circulation desk. I’ve been told this is the equivalent of the candy/gum rack at the grocery store. Except I’m hoping that kids of all ages will check out items from my display. Just a few more pics of my handy work. I’m a bit proud as this is my first book display, ever! Every week my favorite television show started with those words. Many die hard Lost fans have notice a fair amount of nods to literature over the seasons of this compellingly and addictive show. But now there is an official Lost Book Club on ABC.com. Some may see this as ploy to keep the fans hooked on the show but if so they will be more enriched for reading the books. You can see it’s a mix of classics and contemporary novels as well as a few children’s titles thrown in. Think I’ll go back and re-read some of these to see if I can pick up on any clues for Season 5. Wondering if any libraries will use this to help draw in adult readers to their Summer Reading Clubs?